This chapter provides a method for meeting the educational demands of the 21st century. The Content through Action method (CTA) provides a process to plan integrated instructional units for connecting various subject matter areas. Based on the researcher's experience in designing interdisciplinary units, the chapter includes the CTA process of building a unit and the research-based rationale behind each step of the process. The literature review includes discussion of the Four Cs, the 21st-century classroom, the motivation of learners, and the teacher's role. The theoretical framework is built on the foundation provided by constructivism, heutagogy, design thinking, the theory of change, and the growth mindset. 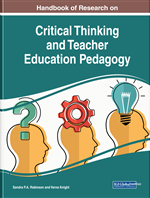 After teaching other methods such as problem-based and design-based learning, the author asserts that the CTA method of instructional planning promotes the development of thinking skills compatible with the needs of the 21st-century learner. Postman (1985) laments the direction America has been taking towards technology serving as a distraction to thinking where all subject matter is presented in a multi-media format to present it in an entertaining manner. He predicts that the country’s attraction towards entertainment will lead to a Hollywood actor becoming the president of the United States. Ronald Reagan and Donald Trump as presidents have materialized the author’s concerns with serious public issues turning into entertainment. This begs the definition of thinking skills if the trend must be shifted from technological entertainment to the necessities of the 21st century education. According to Donovan, Green, and Mason (2014), teaching thinking skills is compatible with the 21st century skills (termed the Four Cs) in the framework of the Partnership for 21st Century Skills (P21). The P21 framework defines thinking skills as a range of ideas and the techniques necessary to create those ideas. The study includes subskills of the umbrella term “thinking skills”: creative thinking and critical thinking, in addition to communication and collaboration. Four Cs: Based on the P21 framework, a guide for the learner to develop creativity and innovation, critical thinking and problem-solving, collaboration, and communication skills. The 21 st century skills embedded in the Four Cs are necessary in life and career environments beyond the school walls. Partnership for 21st Century Skills (P21): An organization providing a framework for the skills needed to be successful in the 21 st century environment, including the framework of the Four Cs implemented in schools in the United States. Curriculum Integration: Connecting various subject matters such as science, social science, math, and language arts under a unifying theme such as preservation. Multimedia: Description of providing various media to communicate ideas requiring technology, maintenance of the technology, and training to develop digital literacy. Multimedia presentations or collaborations employ visual, symbolic, audio, and linguistic forms of communication styles. Constructivism: A theory leading to the teaching methods in which learners construct meaning through process-oriented experience. Design Thinking: A theory associated with the theory of constructivism, leading to teaching methods in which learners design prototypes of solutions to problems in a real-world context. Content Through Action (CTA): A teaching method designed by the author, based on the theory of constructivism and associated with methods such as human-centered design, design-based learning, and problem-based learning. The CTA method focuses on teaching content by integrating the curriculum through process-oriented experience.